I have iterated these statements about Detroit since I graduated from the University of Detroit Mercy in 2007. For 5 years I lived and went to school in Detroit. I cherished my time in the city and learned so much about who I was in that time. Yet I packed up my things and went “home”, back to the suburbs. Fast forward to 2016, I am finally taking the steps to return to Detroit, the city I love! I am back! Why then did it take me so long to return? Trying to find the truth in that question and being honest with myself is something I began reflecting on in the past month. My first reason, or is it an excuse, is friendships. I have a group of friends that I would describe as both unique and irreplaceable. We are a unique group of friends in that there are so many of us, yet all extremely close, we do everything together. I can rely on them to help me without a hesitation or drop what they are doing just to have a good time. We have grown up together, traveled the country, remodeled houses, partied all night, and become part of each other’s families. How was I supposed to walk away from something that is so important to me? I realized that I am not walking away from them, our lives are just evolving. Each of our lives are changing, once I stopped and looked at each of their lives I realized that they have each taken steps in new directions. Some have moved away, some have started families, some have started businesses that demand a lot of their time. These changes have not altered our friendships. I need to let my life change, I won’t be truly happy unless I allow Detroit to be a part of my life. If my friends are as good of friends as I truly believe they are then nothing changes. They will not only accept my passions but also encourage and assist in them. Reason number two Excuse number two, the house I purchased. I bought a house in 2009 and made the decision to completely remodel it. It’s been difficult I have had bumps along the way but I could have finished it. Often times I argued I didn’t have the time. Not having the time is clearly false, it’s been 7 years! I just too often made finishing the house projects a non-priority. Holding myself accountable for not finishing them is something I was not doing. I didn’t have the money to finish I’d tell myself. While there were times this may have been true, there were definitely many instances I could have budgeted my finances better. I could have focused them on getting them done but again I didn’t make them a priority, I traveled, bought vehicles, spent too much time and money going out socially. The house was a factor but it is something that could have been addressed and finished much sooner. Which made me question why wasn’t I making it a priority. I realized the reason when on multiple occasions recently friends stated “I know you will always be there”. At first it made me feel good, it meant I had done and seen many things. It made me feel like I could be relied upon and followed through on my word. As I thought about it longer I began to get upset with myself, was I doing all of these things because I wanted to or because I was afraid of missing out on something? The past 5 or 6 years I have done nearly anything and everything that I wanted to. Someone suggests a trip, I am there, a night on the town, a concert, any event I never said no. Now I have realized that missing out on something only means that I am experiencing something else. Perhaps I am even experiencing something that is more important to me personally. Sometimes I will need to make sacrifices I just need to be tactful on when and how. The last excuse and perhaps the biggest excuse came with much anxiety, the fear of failure. Numerous conversations between myself and others have been focused around success and failure being intertwined. You cannot be afraid to fail in order to be successful, if you are then you will not take the risks necessary to put yourself out there for something new. While I often state this, when it comes to following through I found that I was afraid to fail with Detroit. For so long I have promoted Detroit to others, preached my intentions to become a citizen of Detroit and make a difference there. Everyone knew this and held what seemed like such large expectations for me, what if I did move there and accomplished nothing? 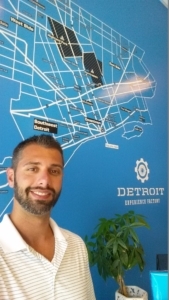 Applying to Challenge Detroit made me realize that this fear was poorly conceived. I am a dedicated individual, I have accomplished many of my goals and follow through on things I say I will do. When a colleague told me to apply for Challenge Detroit, I realized that others hold this perception of myself as well. It was time for me to take action and address the excuses that have held me back from what is going to perhaps the largest life changing event in my life to this point. I am going to do just as Challenge Detroit promotes; live, work, play, give and lead in Detroit. Making sure that I not only get everything I can out of this next year but also preparing myself to continue on that same path afterwards. My true friends are going no where, I will occasionally miss out on things but that’s ok, and I will succeed because I am not afraid of failure!